Tips to help you take care of your biggest investment, your home. Information and resources to help buyers and sellers. Even with an improving economy, many households still carry debt that can create challenges when seeking a loan, according to the non-profit American Consumer Credit Counseling (ACCC). 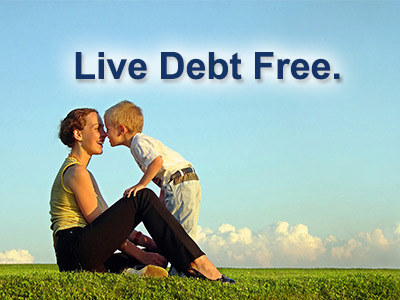 But there are steps that you can take to get and stay debt free. 1. Don’t live beyond your means. You can’t always control the amount of money you make, but you can control the money you spend. One way to avoid overspending is to carry cash instead of a debit or credit card. It’s harder to overspend when you carry cash. If you decide to carry a card, limit spending to only what you can afford to pay off at the end of the month. 2. Pay more towards your monthly minimum. If you are struggling to pay off a credit card with a high interest rate, make sure to pay more towards your monthly minimum. 3. Invest in the future. One of the best ways to plan a financially free future is to save toward your own retirement through an employer-sponsored 401(k) plan. 4. Keep an emergency fund. Set aside a portion of each paycheck, and save a minimum of 9-12 months of expenses in a separate interest-earning account. 5. Insure yourself. Even if your job does not supply it, make sure your medical, disability, home and automobile insurance policies are in order. Insurance gives you peace of mind. With it, you know that if anything happens to you, your family or your business that you will be financially secure.